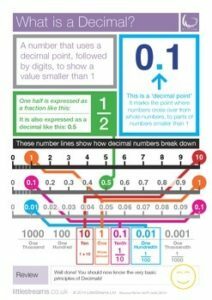 This poster is intended to lay the groundwork for a very basic understanding of how Decimals work, without relying on a comparison to Fractions or Percentages at the very first hurdle. We think that a student should understand the principles of decimals in relation to numbers which are a power of 10, before comparing and contrasting them with Fractions and Percentages. This way, an understanding of fraction conversion can become even stronger later down the line. Download the FREE poster right away, give us a rating, and follow us to stay updated with all forthcoming products! We appreciate your time.